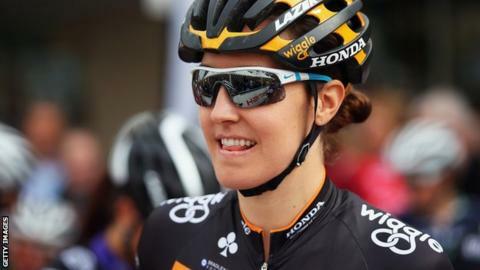 Wiggle Honda rider King, 24, beat fellow British rider Katie Archibald, 21, on Saturday in a sprint finish. King suffered eight broken ribs and a collapsed lung in November while on a regular training ride in south Wales. "I'm so happy to have won after everything that's happened," said Cardiff-based King. "I wanted an aggressive race and had planned to attack, but Katie went so early I knew I'd have to go with it," added the London 2012 team pursuit gold-medallist. King, who decided in October to switch from track to road cycling, takes a slender lead over Pearl Izumi rider Archibald into Sunday's second stage. "As soon as I saw it was Dani that was with me I knew we had a chance of staying away. I just got outclassed at the end," said Glasgow rider Archibald. The event marks the first race of the 2015 Women's Road Series. Although King decided to switch from track to road cycling to ride full-time for team Wiggle Honda, she is still keen to compete on the track in the 2016 Olympics. Read more on Bradley Wiggins: Has former Tour de France winner underachieved?